From the first review I did of the US6 truck kit: As the US began to ramp up for WWII, the major automotive manufactures in the US ceased production of passenger cars early in 1942 and turned their efforts into producing military vehicles. These included GMC, Ford, Dodge/Fargo, White, Diamond T, Mack, International Harvester (IHC), and Studebaker. Of these companies, GMC, IHC and Studebaker concentrated their efforts on all wheel drive (6 x 6) trucks in the 2 ½ ton capacity range. The Studebaker truck, the US6, was only used by stateside US units. However, the Studebaker was produced by both Studebaker and Reo for provision to other nations via Lend-Lease, and as such became one of the most popular and widespread of all of the American trucks. There were more than 193,000 US6 models built by Studebaker as well as 22,000 more by Reo. While the Soviets had come up with the RS-8 and RS-13 rocket projectiles on their own, and built launchers on the ZIS-6 4 x 6 truck chassis for them, it was not an ideal marriage. Only 456 ZIS-6 launchers for the RS-13 were built after which the Soviets searched for a better platform. Ultimately the Studebaker US6, which the Soviets were receiving in quantity, was selected as the best all around choice. The new vehicle, dubbed the BM-13-16N (N being for “Normalized” – standard chassis) was converted in large numbers. After the war, the new Soviet ZIS-151 6 x 6 truck was used – basically a “Russianized” copy of the US6. ICM’s kit of the Studebaker was a welcome surprise when it came out, even though they did not get the tires right and several modelers commented loudly on their disappointment. As a result (and to their credit) ICM went back and revised the wheels, correcting the tread pattern. 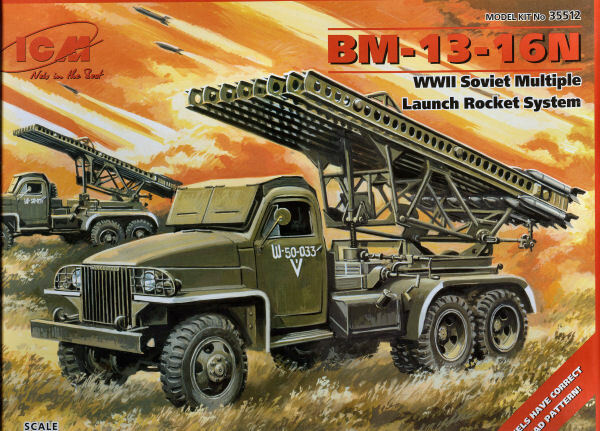 Later on, they added a complete BM-13-16 launcher package to the kit, which is the one now under review here. The breakdown of the kit is very similar to the Italeri ZIS-151 (BM-13 “Katyusha”) kit with a few twists. While the chassis comes in multiple parts (rails and braces are all separate parts) the complete driveline with axles comes as a single unit; this obviates having to assemble and align the various drive shafts and universal joints, which does make assembly a lot easier. Ejection pin marks are still with us, but are either small or easily removed so quality is far better. The kit comes with a complete engine as well as a cab interior. The launcher assembly is patterned directly on the old Italeri one and as a result shares some of its pluses and minuses. They tend to be finicky to assemble and fragile once done, so making them “work” is an iffy thing. It does come with the correct wartime “smooth” pattern to the fender tops (Italeri’s is corregated) and the rockets are single piece body units (apparently how to dodge copyright violations) but the assembly uses the same fin design. Considering the rockets are not all that big this is probably a matter of simplifying assembly, as trying to attach 64 little scale thickness fins would drive most modelers to boredom. The kit also provides the flip-over windshield blast covers and roof protection needed for use with the launcher. Finishing instructions and decals are provided for four different vehicles: Unidentified Unit, Poland 1944 (green with white trim, Sh-50-033); Unidentified Unit, 1944 (green, white B-9-02-14 with artillery cannon); Germany, Spring 1945 (green with Guards and Order of the Red Banner door markings); and Unidentified Unit, Victory Parade, Moscow, May 1945 (green with Guards insignia). The decals are in pretty good register but the red color is far too orange.